WipEout Omega Collection comes with a wealth of content specially designed for lovers of this legendary playstation racing game. 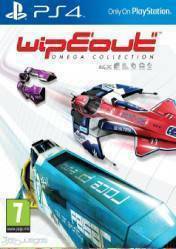 This collection brings together the following franchise titles: WipEout HD, WipEout HD Fury and WipEout 2048, all graphically enhanced for PS4 and PS4 Pro. All the textures of the game have been retouched, greatly improving the graphic section of all the titles as well as the detail of the vehicles and scenarios. Compared to the original games, the textures are much richer on the ships as well as in the effects and scenery we will run in. A series of exclusive Playstation titles and where we can compete in exciting races on ships on circuits and breakneck speeds, with a large number of ships to choose from, each with its pros and cons. There are no comments yet about WIPEOUT OMEGA COLLECTION. You can be the first one!